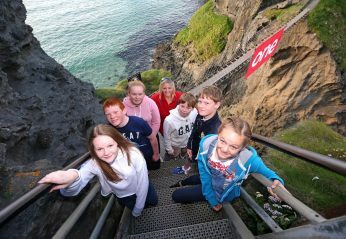 Local kids unfurling the One Show banner at Carrick-a-rede Rope Bridge: Lucy Graham, Kiana Walker, Adam Graham, Josh Bryant, Chloe Walker, Joshua Bennett along with Carrick-a-rede Site Manager Ciara McClements and Enterprise Manager Matthew McMullan. The Regional Director for the National Trust in Northern Ireland has hailed the BBC’s live broadcast as a wonderful opportunity to showcase the charity’s work. 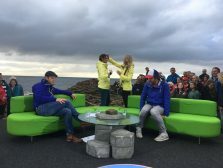 Following a week-long tour of the Causeway Coast, The One Show’s ‘Big Causeway Crawl’ which has seen shows hosted from locations such as Carrickfergus Castle, Ballycastle and Cushendall, culminated in a live broadcast from the Giant’s Causeway on Friday evening by presenters Matt Baker and Alex Jones. Travelling along the North Coast, this is the first time the show has left the London studio and the team have been welcomed with local hospitality as they travelled along the scenic North Coast. 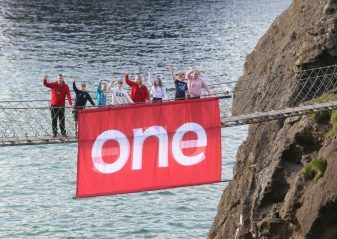 Local children from the North Coast even featured in the show who were spotted enjoying the iconic Carrick A Rede rope bridge experience. 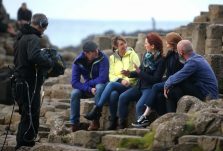 Commenting on the arrival of The One Show at the Giant’s Causeway, Heather McLachlan, Regional Director from the National Trust said, “We welcome over 940,000 visitors each year to the Giant’s Causeway and were delighted to extend a warm welcome to The One Show team. 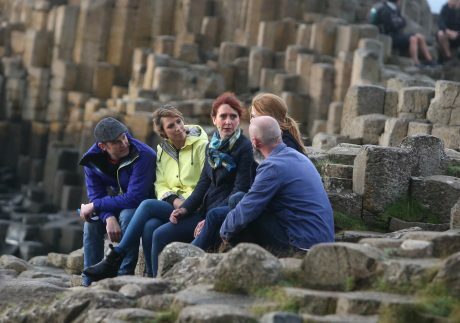 It was a wonderful opportunity for viewers to get a glimpse of the breath-taking Causeway Coast and with over seven million people watching we were delighted to be able to showcase beauty of Northern Ireland’s first World Heritage Site, the Giant’s Causeway. “The National Trust promotes the concept of nature for everyone. Nature is all around us and we depend on it for our survival. We want people to understand and appreciate the importance of nature, to engage with nature more and our job is to help increase access to nature for everyone – forever. ‘The National Trust’s care of the Causeway, its clifftop walks and the whole of the North Coast are good examples of how everyone can engage with Nature. The Causeway was formed about 60 million years ago and is part of our North Coast group which includes Carrick-a-Rede, White Park Bay, Portstewart Strand and Downhill. In fact, as a charity, with the money we raise the National Trust can reinvest in conservation projects throughout Northern Ireland and we look after nearly a third of the Northern Ireland coastline. Therefore we are one of the most important organisations dedicated to the protection and conservation of the natural environment. 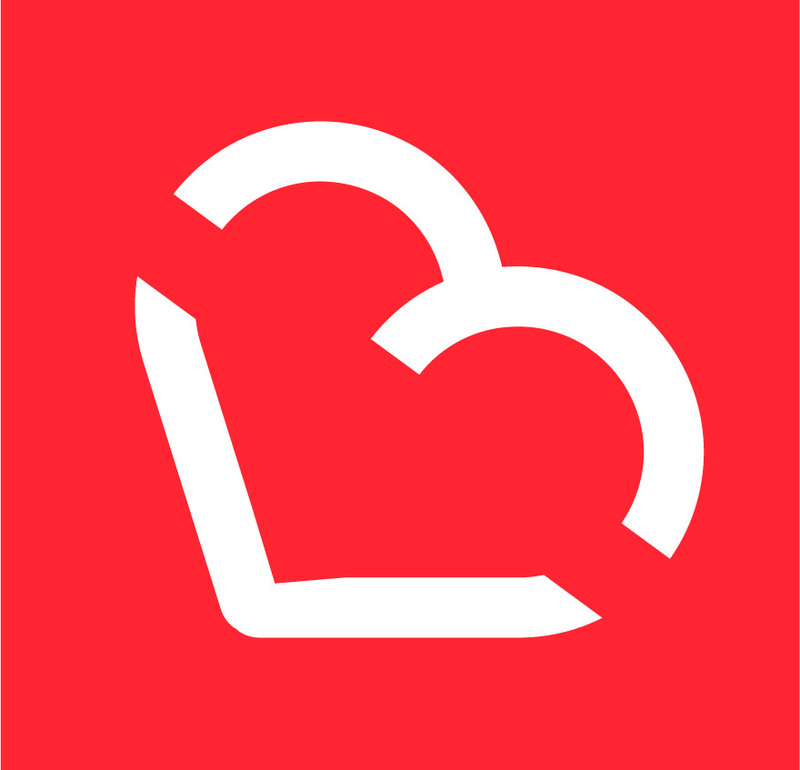 Next articleGet ready and on your bike for the third Ciclovia Belfast!